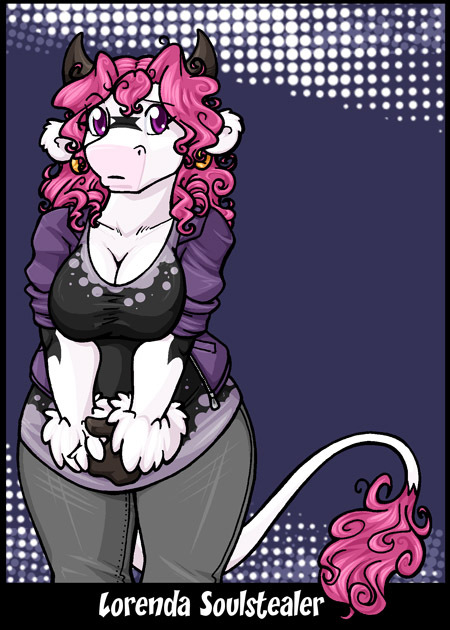 Personality: Lorenda is a very independant character...or at least she tries to be. She is also the most level-headed character...or at least she tries to be. Lorenda often finds herself the straight-man of a group simply because the company she keeps is often so eclectic. Unlike other half-demons, Lorenda works really hard on maintaining a normal life that is devoid of chaos and destruction. For the most part Lorenda works rather well in normal society but every now and then she slips back into her demonic tendencies much to the encouragement and glee of her mother. Lorenda hates feeling in debt to anyone and will go the extra mile to return favours and gifts. Given the chance, Lorenda can be downright silly and hardly ever passes a chance to drink and party. All in all, Lorenda is a very open and honest individual who usually tries to solve confront issues when she sees them developing. In her freetime, she likes to read romance novels.